The cusp of the late 15th and early 16th centuries witnessed a surge in construction in Moscow, capital of the powerful centralized Russian state, which had grown out of scattered principalities in the northeast of Rus. Russian and Italian architects were building sturdy ramparts and towers for the Moscow Kremlin and erecting cathedrals and magnificent palaces whose majestic beauty astonishes even today. It was at that time that the first mentions of the treasuries of the new "Tsar's court" are found - the Fisc (or, Public Treasury), the Armoury Chamber, the Stables Treasury, the Tsar's Private Treasury and others. The Kremlin was the repository of the country's main treasures: the Fisc, the official regalia of the grand princes and later the Tsars, and precious tableware, luxurious clothes, weapons, and ceremonial horse harnesses. All those objects that so impressed the public during majestic ceremonies were used on a daily basis and, most importantly, represented the image of Russia and its rulers in the public eye. In the early 18th century activity at the Kremlin's treasuries and workshops was declining, as hundreds of the best craftsmen including artists, woodcarvers, jewellers and armourers were moved to the new capital, St. Petersburg. The administrative offices were also often restructured. In 1727 they all were incorporated into a single institution - the Workshop and Armoury Chamber under the supervision of the Senate. The Chamber became the repository of the country's historical memory, its relics and ancient symbols, which over the course of the 18th and 19th centuries were regularly displayed at the most important official ceremonies. A new age began in the history of the ancient Moscow treasures as they became part of a famous museum collection. 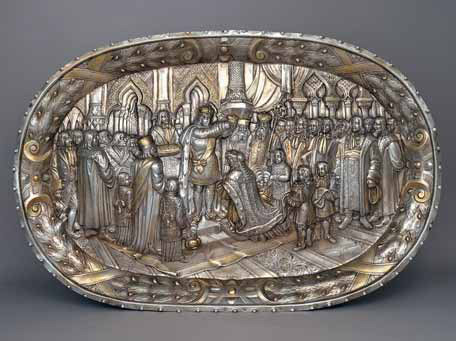 This period is the focal point of the main anniversary exhibition at the Moscow Kremlin Museums, "Russian Emperors and the Armoury Chamber". The exhibition spans a huge period, from the beginning of the 18th century to the early 20th century, telling the story of how the first museum of Russian national history and culture was created by Russia's rulers. The exhibition has two sections, housed in two halls of the museum. The first section is located in the One-Pillar Chamber of the Patriarch's Palace, and focuses on the 18th century. When the capital was transferred to St. Petersburg, Moscow ceased to be the main political centre of the Russian state. Moscow and its historical centre, the Kremlin, acquired a new status - that of the old capital, the keeper of national, political and governmental traditions. Moscow was the great reformer's choice as location for the nation's key ceremony, the coronation of the Emperor. Peter I introduced the new tradition by crowning himself and his consort Catherine on May 7 1724 at the Assumption Cathedral in the Moscow Kremlin, "according to the customs accepted in all Christian nations". The new title of the Russian rulers, the Emperor, called for changes in the entire set of symbols of power, namely the state regalia. 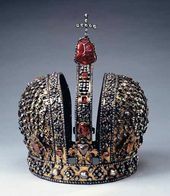 At the first coronation in Russia, a crown and a cloak were added to the sceptre and globe that had been the indispensable attributes at enthronement ceremonies in Russia since as early as the 16th and the 17th centuries. The edict issued by the Commission for the Coronation of Empress Elizaveta Petrovna on April 16 1742 mentioned a sword and a national banner, along with a crown, a sceptre, a globe and a cloak. The sword was chosen from the Armoury holdings - the best one of those "kept there". 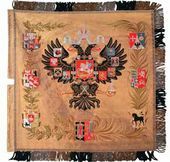 The banner featuring the national coat-of-arms with the "signets" (symbols) of all the lands belonging to the empire was made of yellow satin and decorated with golden-threaded fringe and tassels. Interestingly, the honour of carrying Russia's first national banner, at the head of the procession, was bestowed on the "general en chef", a holder of the St. Alexander Nevsky order and the "principal" of the Workshop and Armoury Chamber Mikhail Volkov. 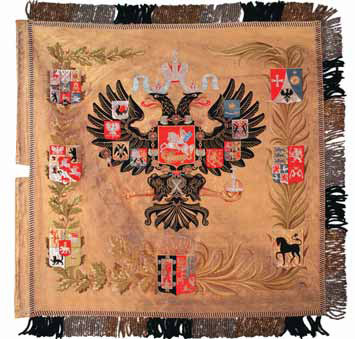 Unlike other imperial regalia, the national banner and the sword were kept in the Workshop and Armoury Chamber, rather than St. Petersburg. In the 18th and 19th centuries, the Chamber was the place where different royal coronation apparel, clothes and accessories were placed after the official ceremonies were over. Restructuring the activity of the Kremlin workshops and treasuries, the Russian rulers sought not only to preserve, but also to increase the collections accumulated over many centuries. In 1709, on the order of Peter I, the booty of war from the Lesnaya and Poltava battlefields, where the Russians fought the Swedes, was sent to the Moscow Kremlin. 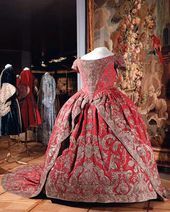 Earlier still, in 1705, the apparel of the monarch himself was sent from the Transfiguration Palace to the Kremlin repository. In March 1723 the Kremlin received a masquerade costume that Elizabeth I had worn at a festivity in Moscow celebrating the anniversary of the Nystad peace treaty. 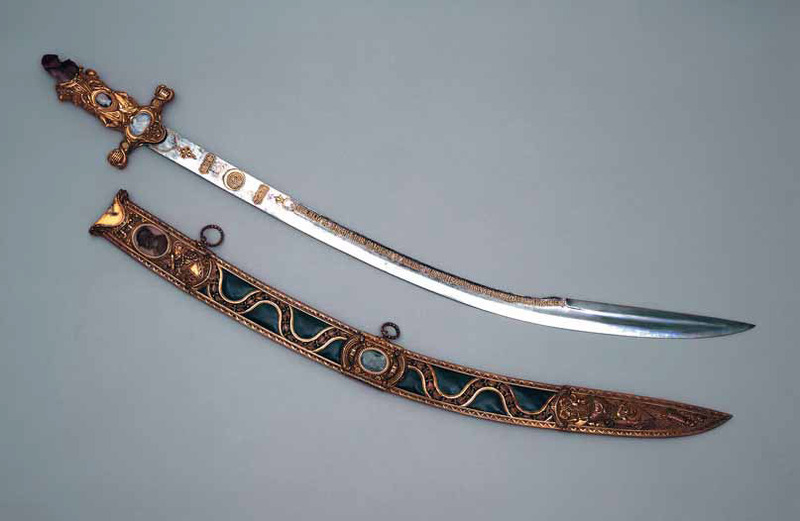 The royal decree issued by Anna loannovna on December 20 1737 prescribed that sabres bejewelled and gold- and silver-trimmed, guns, horse harnesses, adornments "made of diamond and other stones" be sent to the Chamber, because "it befits the Chamber to keep objects that are curious". As early as the 18th century the first attempts were undertaken to make some collections available for public viewing. 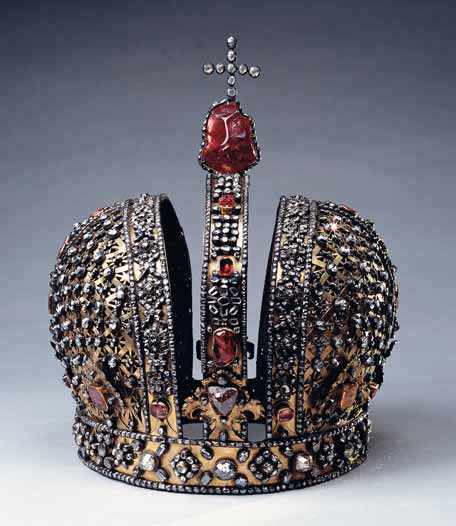 In 1718, on the edict of Tsar Peter I, the Kremlin's antiquities (crowns, bejewelled neckpieces decorated with religious imagery, globes, sceptres, jewellery, and out-of-use royal ceremonial costumes) were for the first time put on display in the Workshop of the Fisc in glass-cases, allowing the distinguished public to see them "as they are". Efforts to showcase the treasures and to decorate the interior continued during the reign of the Empresses Anna loannovna and Elizaveta Petrovna. Catherine II ordered the manufacturing of new alder wardrobes for coronation dresses and cases for storing the ancient state regalia, to be placed in the Workshop and Armoury Chambers. In addition, wooden dummies were made for showcasing the ancient suits of armour. The mannequins were made "to human proportion", in different positions and at least 2,25 arshines (63 inches) tall, because "dwarfs do not wear corselets". Old documents have numerous references to noblemen taking a tour of the treasuries. However, despite the efforts to safeguard and keep track of the treasures, many problems continued to face the principals of the Workshop and Armoury Chamber. The premises were in a poor condition, causing damage to the objects stored. A fire that occurred on May 29 1737 caused major losses to the Kremlin collection. Some of the antiquities would be withdrawn, sent to St. Petersburg and even put to personal use both by the rulers and their favourites. This situation could not but strike the Russian conscience, well aware as it was of the enormous national, historical and artistic importance of the artefacts kept in the Workshop and Armoury Chamber. The first person to try to change the situation was A.M. Argama-kov, a future dean of Moscow's university and a Collegiate Counsellor - he sent to the Senate a report about the "improper maintenance of the treasures and archive". He proposed a scholarly systemization of the holdings, the publication of an illustrated catalogue (in Russian and other languages too), and the construction, in the Kremlin, of a special gallery for the antiquities collections, where visitors would be admitted at least once a week. In other words, the idea was to establish a real museum at the Moscow Kremlin. To the design of a famous Russian architect D.V. Ukhtomsky, construction of the gallery began in late 1756, near the Annunciation Cathedral. However, barely built, the building was demolished in 1768 because of plans to build a new grandiose palace designed by Vasily Bazhenov. It was only in the early 19th century that final steps were taken to protect the Kremlin antiquities collections and to make them into a museum. The history of the creation and development of the museum in the 19th century is the subject of the exhibition's second section, located in the Assumption Belfry. 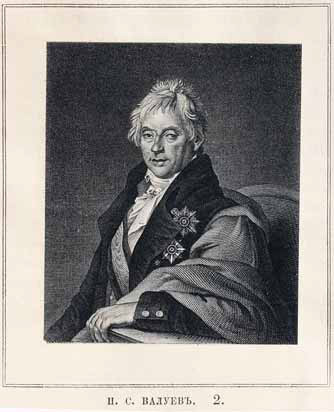 In 1801, an energetic administrator P.S. 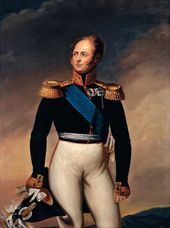 Valuev was appointed principal of the Kremlin Construction Works Board, into which the Workshop and Armoury Chamber was incorporated in 1805. At the same time, following the Tsar's approval, Valuev was laying the groundwork for a reform of the Armoury, which led to the Emperor's decree of March 10 1806, "Re: Rules of managing and keeping in order and safety antiquities deposited at the Workshop and Armoury Chamber". In the same year, on a site near the Trinity Tower, to the design of architect I.V. Egotov, the construction of the building for the Chamber began, to be finished in 1810. The 1806 Rules prescribed that a restoration project be commenced "without the slightest delay". The plan was to make a new inventory of the holdings and to compile a "historical catalogue", to be financed by the Imperial Cabinet. This task was assigned to A.F. Malinovsky, an honorary member of the Armoury Chamber and the custodian of the Foreign Office archive. In 1810 Valuev submitted a "description of the rooms" of the future museum to Emperor Alexander I, who familiarized himself with, approved and authorized all the proposals. The invasion of Napoleon's army thwarted plans for the museum. The day before the battle of Borodino, all the Chamber's collections were expeditiously packed into boxes and sent by road to Kolomna, from where they proceeded by water to Nizhny Novgorod, before final removal to Vladimir. 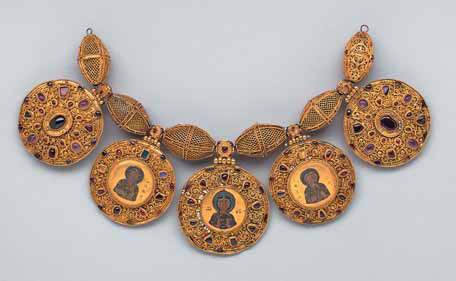 In 1813 the collection was returned to Moscow. 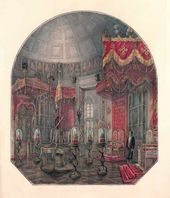 The arrangement of the first permanent museum-like exhibition at the Armoury Chamber, as well as repairs of the damage done by the French to the Kremlin, was carried out under the supervision of Count Nicholas Yusupov, who, in 1814, was appointed Principal of the Kremlin Construction Works Board and the Workshop and Armoury Chamber. It was during his tenure that the traditions of the organization of the museum's work, exhibition activities and the reception of visitors were conceived. Any tour of the museum, from October 1814 onwards, would typically start with the Throne Hall, where a display of the ancestral regalia affirmed the idea that the Tsar's power is god-given and can be traced back, politically and spiritually, to the Byzantine emperors. Also on display was the original of the 1649 Council Code. The display of the regalia was followed by an exhibition of the "crowns of the kingdoms conquered", which traced the history of Russia's growth and expansion. 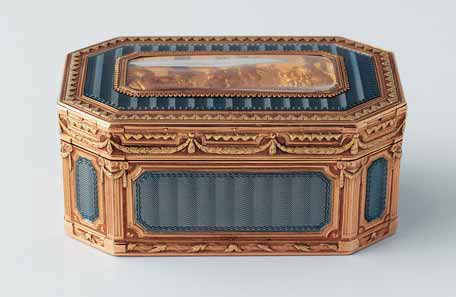 Russia's position in the world was the theme of the following hall, featuring ambassadorial gifts, grouped by gift-makers and gift-receivers. The "Armaments" section of the museum was focused on the country's military might, showcasing Russia's key military regalia - the sword, the shield and the colours of the state. The trophies of war from the most famous victories were displayed separately. Thus, the Workshop and Armoury Chamber in the first quarter of the 19th century became Russia's first national historical museum, where every exhibit reflected the idea of the "eternal glory and might" of the Fatherland. In 1831 an imperial edict introduced new regulations, by which the museum was henceforth to be called the Armoury Chamber, and introduced the position of museum director, who was to possess, if not a specialized education, then at least "conversance" with the science of history. In the 1840s-1880s the director's post was occupied by a succession of individuals who distinguished themselves in Russian science and culture - the writers M.N. Zagoskin and A.F. Velt-man, and the historian S.M. Soloviev. In 1837 the Chamber's collection of documents pertaining to the court administrations started to be sorted out by I.E. Zabelin, who was later to become one of the most renowned scholars of the everyday life of the Russian court and the founder of the Historical Museum. 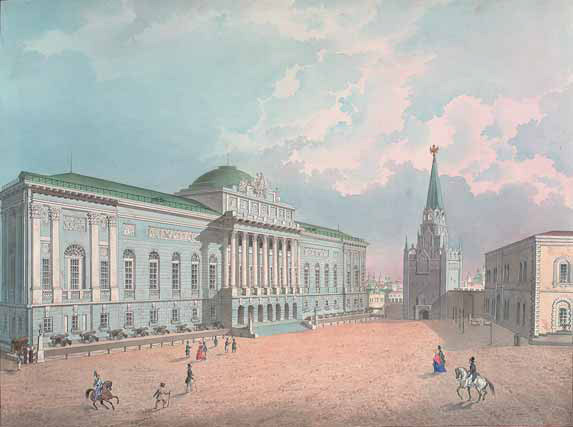 In 1851 the architect Konstantin Thon built a new museum building on the southwestern corner of the Kremlin, near the Borovitsky Gate, where the museum is housed to this day. The edifice is a part of the Great Kremlin Palace; the high intersecting vaults of the staterooms, the slender columns with beautiful caps, and huge two-storied windows lend a festive and majestic air to the museum interior. When, in the mid-19th century, a new exhibition was put together in the Armoury Chamber, it was done in keeping with the tradition of the past. Nine themed halls were arranged. The second floor housed the Armour, Weaponry, War Booty, Crown and Silver halls, the first floor -the Prayer, Portraits, Carriages and Household halls (the latter was also called the Icon Hall). The Crown Hall was the exhibition's conceptual centre, presenting a synthesized image of the Russian monarchy, where the images of the Russian rulers, sovereigns and Emperors were placed alongside the "ancient attributes of hereditary kingship and sacred enthronement of the Monarchs of Russia". Contemporary scholars believe that the space of the hall, rigidly arranged and saturated with symbols, performed the function of a sacral place of Russian history. It was not by chance that from 1855 onwards this hall served as the stateroom where Russia's national banner would be consecrated on the day before the coronation of a Tsar. In the second half of the 19th century the museum became one of Russia's key research and methodology centres. 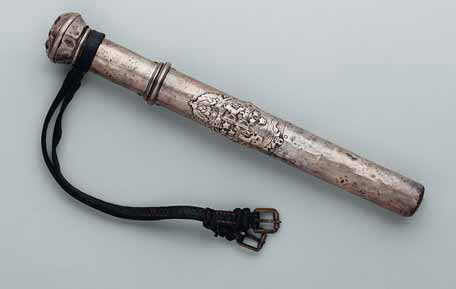 The team of researchers included the prominent archaeologist and art scholar G.D. Filimonov, the expert on weaponry L.P. Yakovlev, and the archeographer A.E. Viktorov. In the early 20th century, the museum was headed by two custodians, the renowned art scholar, archaeologist and numismatist V.K. Trutovsky, and the historian Yu.V. Arseniev. In the 1860s-1880s the museum researchers accomplished a project that was unprecedented for the time - the compilation and publication of the Inventory of the Moscow Armoury Chamber, a work that remains an authoritative source to this day. Muscovites and tourists developed a keen interest in the museum. Visitors were allowed three times a week on weekdays and on one Sunday each month for two hours. The museum was frequented by students of the Stroganov Art School; when it was closed to visitors, artists worked there. Many of the museum exhibits served as models for paintings by Konstantin Makovsky, Vasily Surikov, Viktor Vasnetsov and Ilya Repin, and sculptures by Mikhail Antokolsky. The distinguished guests' book at the Armoury has autographs by the great Russian writers Ivan Turgenev, Fyodor Dostoevsky and Leo Tolstoy. With the onset of the 20th century a period of world wars and revolutionary unrest began in which the Kremlin museum was to play a remarkable role. 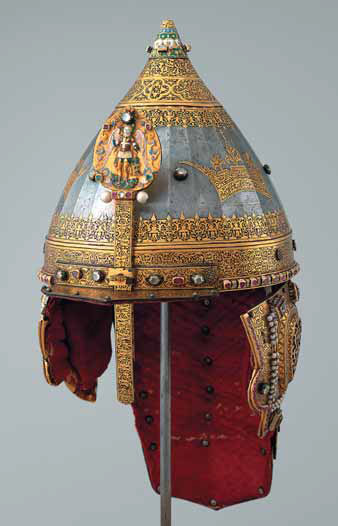 During World War I the Armoury, the carrier of the ancient tradition of looking after the treasures of the court, received for safekeeping many thousands of unique objects and collections evacuated from the royal palaces and museums in St. Petersburg. 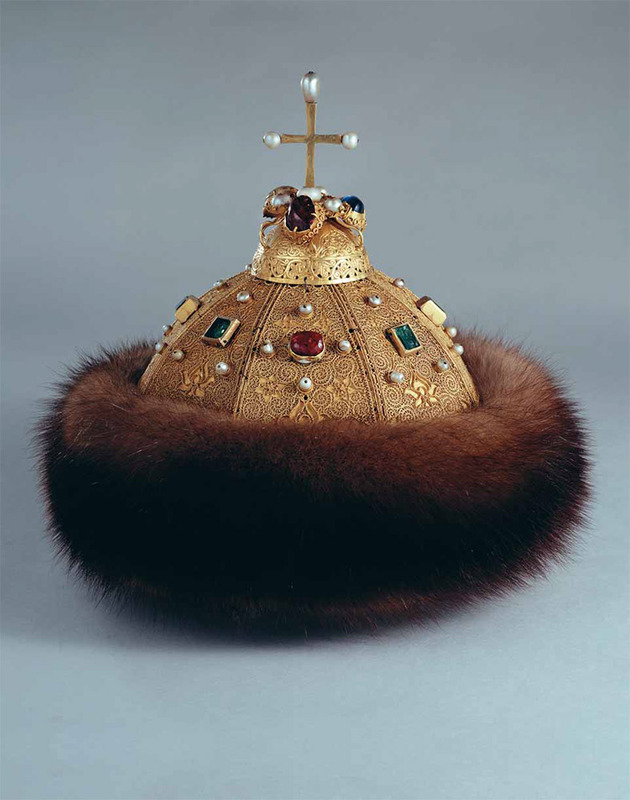 The state regalia and crown jewels of the Russian royal family were moved there first of all. 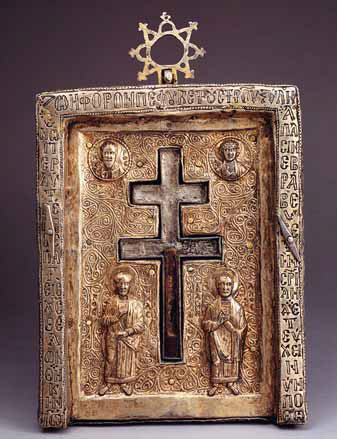 After the October revolution, the museum also received relics and artefacts of Russian Christian Orthodox art from the monasteries and cathedrals of the Moscow Kremlin and the Patriarch's Vestiary, and precious objects from the churches and monasteries that were shut down or demolished. With the nation suffering from hunger and devastation, the young Soviet Republic needed money. Art objects were confiscated for the benefit of a Hunger Relief Fund, and the crown jewels and other valuables were handled by the People's Commissariat of Finances, who had them recast or auctioned. There was a real chance that many unique architectural monuments of the Moscow Kremlin would be demolished. During those years of turmoil, the staff of the museum proved to be the Kremlin's real asset. A small team under the leadership of the first directors, Mikhail Sergeev and Dmitry Ivanov, did all they could to protect the objects with which they were entrusted. In 1920 the Armoury Chamber worked more than diligently to return to the Hermitage and the Russian Museum the collections that had been evacuated to Moscow when World War I began. The task of sorting out the crown jewels, which included the state regalia, jewellery, precious stones of historical importance, and decorations, was especially difficult. The exhibition's last section is dedicated to the great deeds of the museum staff in salvaging the imperial crown jewels. A new age duly began in the museum. Under the Soviet regime, the Armoury could no longer exist as a museum focused on the history of the state power of the Russian Empire, and its whole concept was changed. 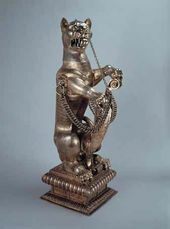 Since then, the museum's function was to present the history of Russian and international fine and applied arts, highlighting their craftsmanship, rather than historical significance. Under Soviet rule, the Moscow Kremlin Museums saw many changes. There was a time when they were practically closed to visitors, but from the 1960s through to the 1990s they saw an upsurge in all kinds of activity. Today, thousands of Muscovites and visitors to the city come here to see the best examples of Russian and international culture. Walking from one hall into another, from one showcase to another, they relish objects that are unique in their beauty and cannot be found anywhere but in the Moscow Kremlin - objects that are intimately connected with the history of Russia, guarded vigorously by our ancestors through the most difficult years of history.